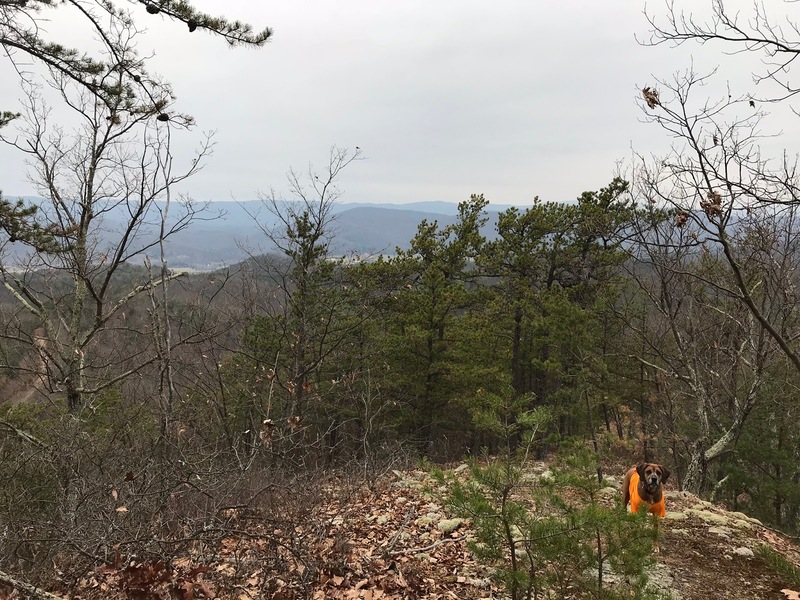 The point of this blog is to feature remote and obscure trails in Virginia, so that they don't fade into oblivion while 95% of the state's hikers rush to hike locations like Old Rag and MacAfee Knob multiple times. This description highlights one of the more remote and obscure trails in the George Washington National Forest. The Marshall Draft Trail climbs the west side of Shenandoah Mountain in Bath County. 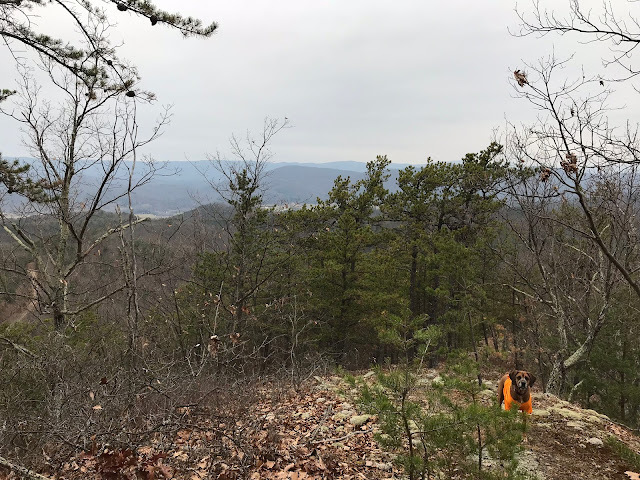 I hiked it to access a section of the Shenandoah Mountain Trail I'd not yet explored, and to check out the site of an old fire tower. My personal definition of a "remote" trail hinges on how long I have spent off pavement getting to the trailhead. Under this definition, the most remote trailhead I've achieved is the western end of the Sinclair Hollow Trail, found on the west side of Ramsey's Draft Wilderness. Arriving at this trailhead took over 90 minutes on dirt Forest Service Roads to reach, riding in a high clearance pickup truck because my Outback would not be able to handle the access roads. Parking along FS 394 just north of the trailhead. Trailhead sign is somewhat visible on the right. The Marshall Draft trailhead is not quite as remote as that, but it is certainly among the top 5 most remote I have reached in Virginia. From Charlottesville I drove 85 miles over 2 hours, including 7.5 miles (24 minutes) on dirt/gravel forest service roads to get to this trailhead. The trailhead is located on a twisty road (Sugar Tree Road - FS 394) off of another dirt road (Scotchtown Draft Road - SR 627) on the west side of Shenandoah Mountain in Highland County, Virginia. The trailhead coordinates are N38° 10.242' W79° 32.544'. Coming south from U.S. 250 is a little harder, because the turnoff from SR 614 is unmarked. Heading south on SR 614, the turnoff onto FS 394 (here called Nelson Draft Road) is just south of SR 614's Cowpasture River bridge crossing. View from the trail looking down at the parking area. The trail climbs steeply right from the start. 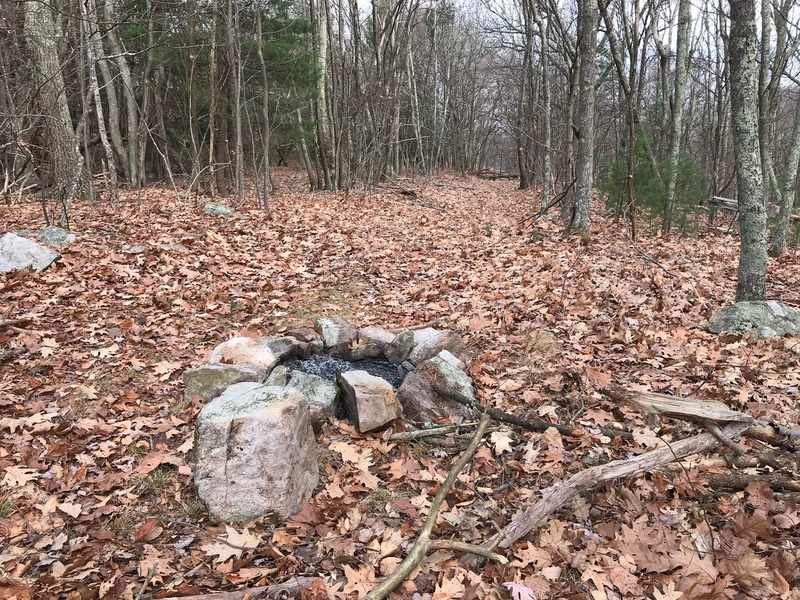 I hiked the trail during hunting season as I knew the access road would be passable. Earlier in the year I attempted to reach the same trailhead but was thwarted by a tree that fell down across the entire roadway. The trail itself is marked by a trail sign that had deteriorated to the point that 2/3 of the sign was rotting on the ground. 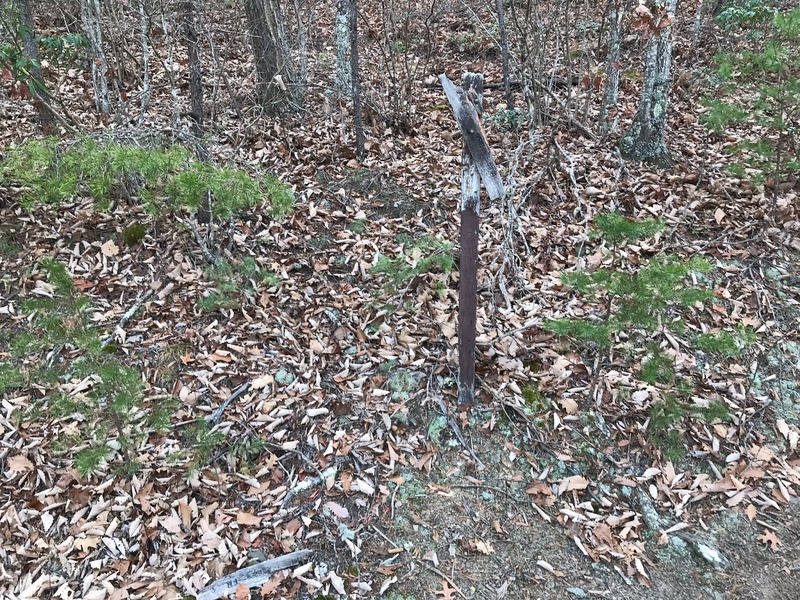 This decaying signpost marks the lower end of the Marshall Draft Trail. This photo shows the Marshall Draft Trail ascending from the access road, then switching back a the double diamonds. The trail deceptively switches back about 20 feet into the hike, takes a right turn about 100 feet later, and then climbs straight up the mountain. 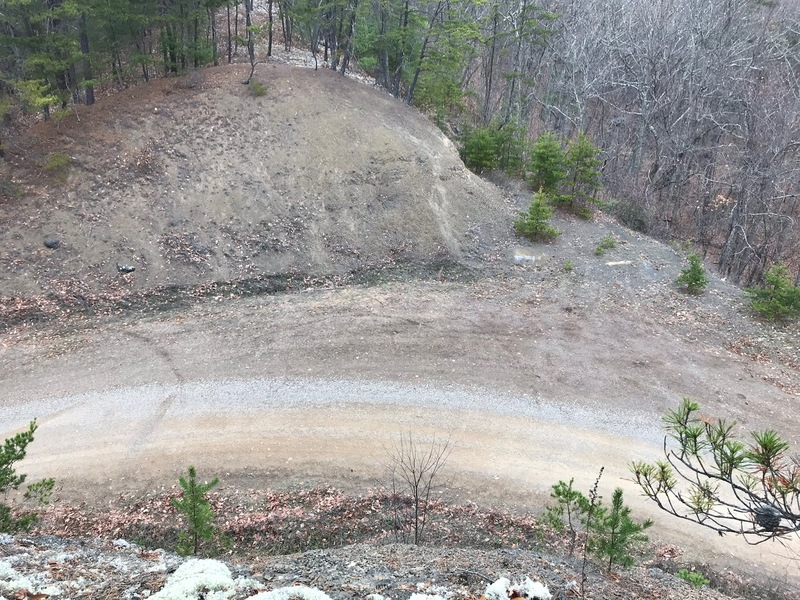 It is deceptive because you won't again see a switchback over the entire trail! The first 4/10 of a mile climbs at a whopping 23% grade before moderating only slightly to an 18.2% grade over 7/10 of a mile. 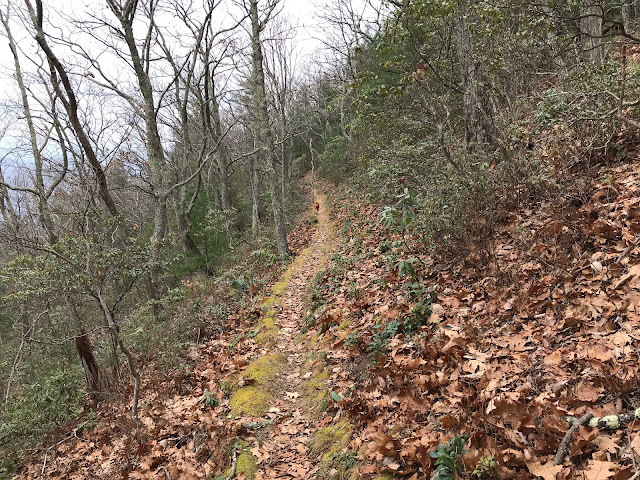 In its 1.3 mile total length, the Marshall Draft Trail climbs from 2200 to over 3500 feet elevation. Needless to say, it provides an incredible workout! The Marshall Draft Trail ascends along the side of a mountain ridge. It washes out a little about 2/3 of the way to the top, but generally is in great shape. 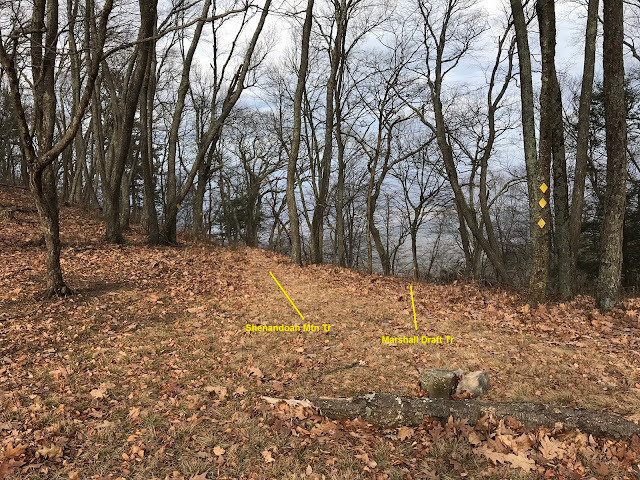 This intersection is a saddle between two peaks on Shenandoah Mountain - Wallace Peak (3795 ft. elevation) and a higher peak to its northeast named, appropriately, Northeast Peak (3811 ft. elevation). Wallace Peak is of more interest, described in detail below. Also at this intersection is a potential camping spot, and a wildlife pond. 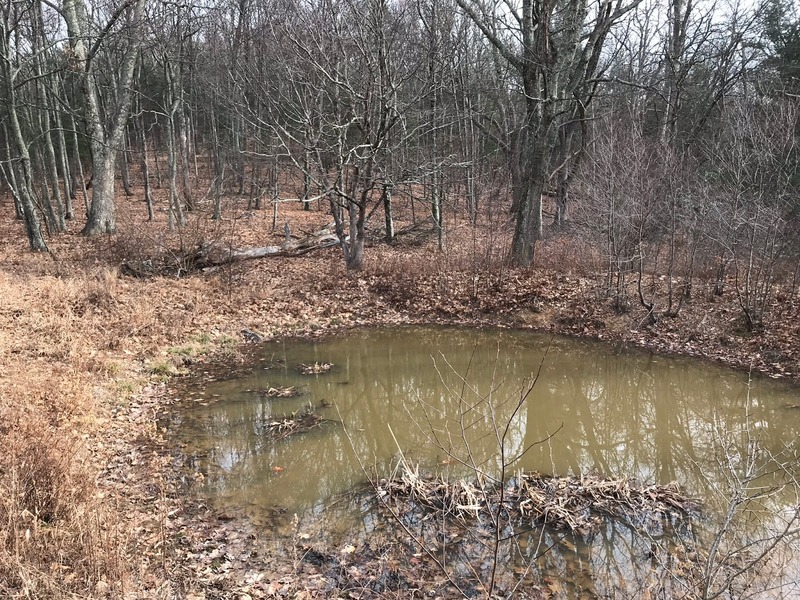 Wildlife Pond on Shenandoah Mountain. A road used to come up here from the east (along a stream with the wonderful name of "Jerkemtight Branch"), and maps now show the road permanently gated near its eastern end. The road actually continued to the summit of Wallace Peak, and it must have been closed when the old fire tower on the summit of Wallace Peak was eliminated. I was curious to see the summit, as I had heard that locals often hike up there. Would there be a view? It wasn't easy to find out, as it took me some time to find the road's location. The access road isn't found on my trail map, and though it is obvious at lower elevations coming up from the east, it disappears near the wildlife pond. I eventually found it - I am pretty sure the wildlife pond sits where this road used to be. There is a large pine tree just uphill from the pond, and the road reappears just to the west of that tree - toward the SMT. As you can see from the photo above, the roadbed becomes very obvious once you get away from the wildlife pond. There is even a campsite in the middle of the roadbed about 1/3 of the way up from the pond. 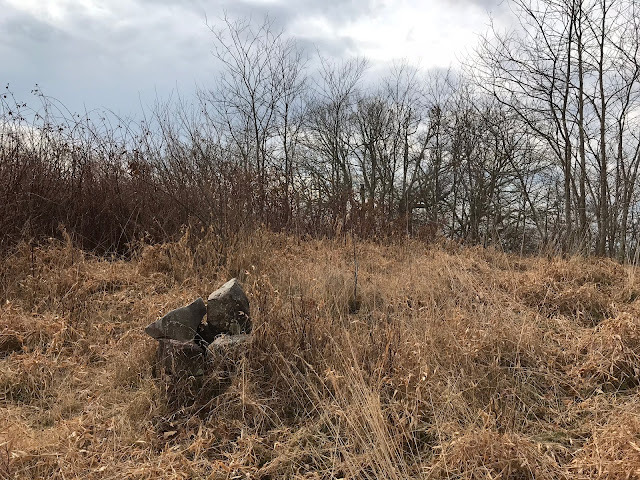 It is about 3/4 of a mile each way to the summit and, though I found the base of the tower, there was no view to speak of up here. It was an easy and obvious route to the summit, once found. The rocks mark one of the concrete bases for the tower. Panoramic view from the summit of Wallace Peak. USGS Topo shows the location of the road to Wallace Peak. Though it is no longer used, it was easily found once away from the intersection. After returning from the summit, I headed north on the Shenandoah Mountain Trail. I had hoped to link up with the intersection of the SMT and the Nelson Draft Trail, which I had reached earlier in the year on another hike. It was a pretty dreary day, however, and a fine rain started when we were hiking north. I gave up after completing about 2.3 trail miles north from the MDT, figuring I'd try again another day. Upon returning home and downloading my GPS data onto my computer, I was surprised to see that I was still over 3 miles as the crow flies from my goal. I am glad I turned around, as I might still be out there! 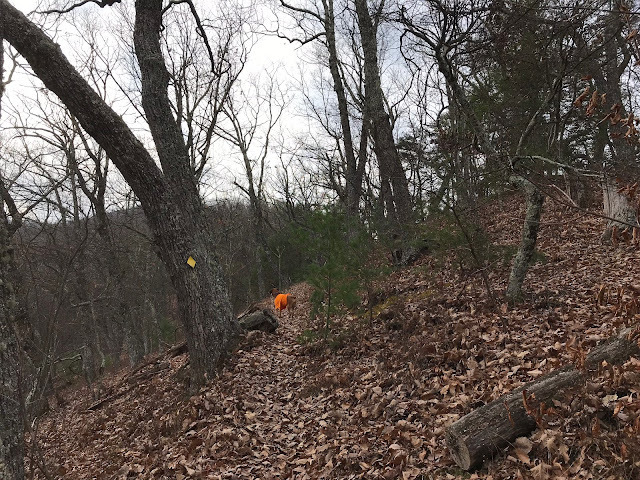 The Shenandoah Mountain Trail is a really long, remote trail. It extends about 25 miles between paved road crossings and this portion of the trail goes for over 17 miles without road access of any kind. It is a relatively popular mountain bike trail, and given its length, this makes perfect sense. The mountain biking community has had a profound effect on this trail, both good and bad. The bikers are good for the trail because they clean blowdowns off of the trail - this trail would not be in nearly the shape it is in without them! But they also use the trail when conditions are wet and their tire tracks form channels which cause "cupping" in the trail. Rain uses the trenches and erosion is hastened. which will further deteriorate the trail as rainfall runoff channels into the trench. This section could use a couple of water bars, which divert the rain off of the trail and downhill. Bikers hate this form of trail protection because it gets in the way of long coasts on bikes. 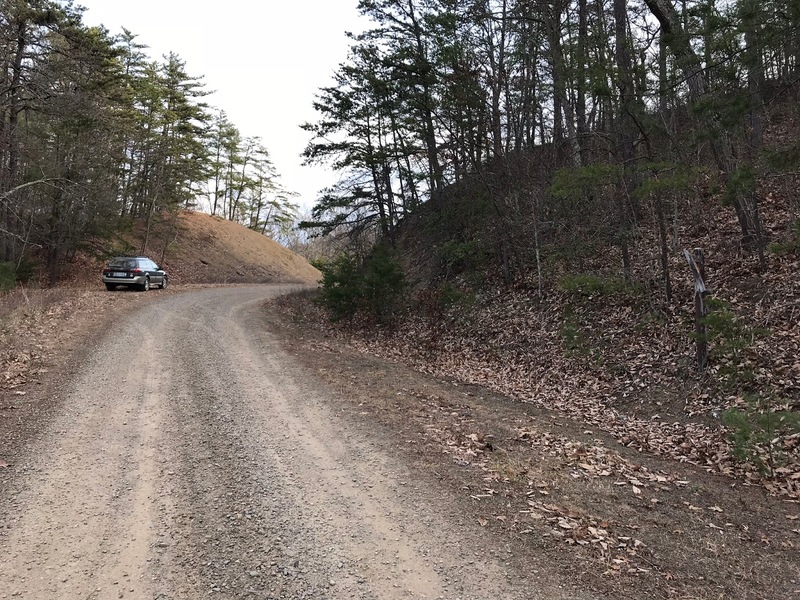 It is interesting to note that USGS maps dating back to 1946 indicate that the Marshall Draft Trail used to continue past the road where I accessed it (as this road remained unbuilt on most maps). The trail continued all the way almost to the town of Williamsville on the other side of the Cowpasture River. The current trail is only about a third of the original trail, though the western portions of the trail are on private land. 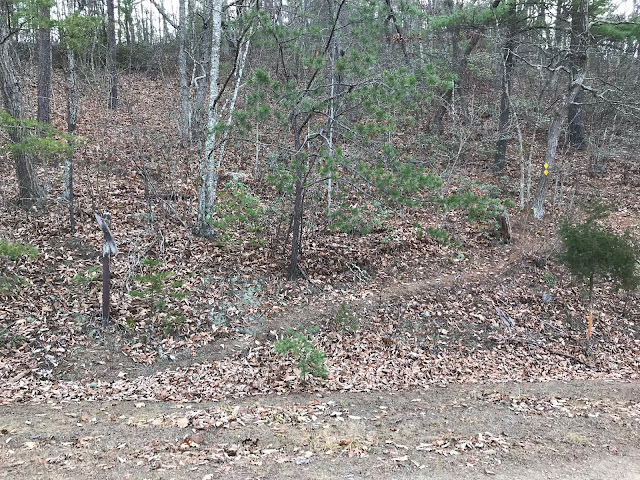 I saw a trail continuing past the road, possibly to meet up with the original trail. The road's construction blew away the portion of the ridge that the trail originally used. shows the Marshall Draft Trail continuing until meeting a rough road near the Cowpasture River. That is quite an adventure! Thanks for sharing. Thanks for having a site like this. You see parts of Virginia most people are unwilling, unable, or afraid to see. Thank you for hiking these trails and encouraging the USFS to keep them open. Thanks for the excellent report. I went out this past Friday (1/18) and didn't see another soul for 26 hours. The drive wasn't too bad in an outback with 4" of snow on the ground. The trail itself was just as steep as was promised, and not too difficult to follow even with snow on the ground. I wished I'd brought a walking stick, but found a suitable branch when I ate lunch in the hammock The wildlife pond was frozen over, and it was very peaceful in the woods.